A relatively weak winter storm, will bring major impacts to the Midwest Sunday and Sunday night. The worst part of the system will be the major icing. 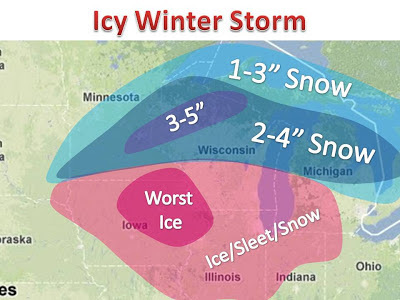 The worst accumulating ice looks to take place in Iowa, with up to a third of an inch. This will bring tree branches down an take out power for thousands. The hope is that the areas that see freezing rain will switch over to all rain and lessen the blow. On the far northern extent snow will fall, but nothing too serious. Be sure to check local advisories on this system. Forecasts will change, as a tenth of a degree will affect icing!